An artist who rarely signed his own work, Amberger was a German painter from Nuremberg in Bavaria. He may have began his training as a painter in Augsburg, Bavaria with Leonhard Beck (1480 – 1542) and then with the German painter and printmaker Hans Holbein (1497 – 1543). He was accepted as a German master in the Painter Guild of Augsburg in 1530. Before this, his travels to Italy and Venice influenced his work seen in pieces such as, Portrait of a Husband and Wife and also Portrait of Anton Welser. The influence of Italian art also came to him in meeting with Venetian painter Titian (1488 – 1576) in 1548. One of Amberger’s well known portraits was of Emperor Charles V from around 1532. He frequently received private commissions from wealthy merchants, among them his portraits of George von Frundsbergs, Konrad Peutingers, members of The Fugger Family and the Welser family. 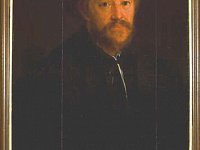 Other well known Amberger portraits are his Portrait of Cosmographer Sebastian Munster (A German Scientist) painted in 1550 and also his 1554 work now at the Uffizi Gallery, Portrait of Cornelius Gros. Amberger also painted an altarpiece in the Augsburger Cathedral. He past away in Augsburg in 1562.